I’m sure it hasn’t escaped your notice, but this is National Children’s Book Week. (Okay, before this last week, I had never heard of it.) But I’m certainly glad to be on the bookmobile now! Children’s Book Week was started way back in 1919. It was considered a way to honor teachers, librarians, authors, and parents who all play a part in placing a book into a child’s hands. Also, BlogHer is celebrating all month long with a campaign called Books Make a Difference! From May 3 to May 28th, BlogHer is teaming up with the nonprofit organization First Book and BookRenter. And with your help, they will be donating a book that will be donated to a child in need. Go here to see how you can help! Every once in a while I come to you all for great book suggestions. And because of you, I’ve amassed a wonderful list of reading material for my kids. I still get e-mail asking for the link to the book list post, and in honor of National Children’s Book Week, I wanted to post the list again. And btw, who else besides me misses seeing Reading Rainbow? I thought it was a brilliant PBS show that after 23 years on the air, was still relevant. I’m still bitter about it being cancelled. (But then I still haven’t recovered from the demise of Dark Shadows over 35 years ago, either.) A grudge? I can hold it. Happy reading! And please feel free to add your own childhood reading suggestions! We have read quite a few of these and loved them. But you MUST read Frindle by Andrew Clements. We absolutely loved it. We are currently reading Twenty-One Balloons and my kids love it. We also recently finished The Endless Steppe, One Grain of Rice and The Year of the Boar and Jackie Robinson. All great books. So why did Book Week change from November to May? They moved the date in 2008. 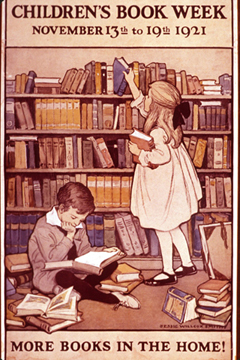 It was about the time that the responsibility for Children’s Book Week shifted to Every Child a Reader, which was the philanthropic arm of the children’s publishing industry. We recently read Mr Popper’s Penguin and LOVED it! Your list looks great but is definitely missing My Father’s Dragon and the 2 that follow. Excellent books! Oh and right now we are reading the Boxcar Children series (we are on 2). My 5 yo son is LOVING them. And ditto to Mr. Popper’s Penguins. Keep an eye out, Reading Rainbow may be back some day. LeVar Burton announced on his Twitter feed on March 19, 2010, that Reading Rainbow 2.0 is in the works. How do I have no idea what the heck Reading Rainbow is? I feel like I have lived the wrong life or something! I’m off to google land now! PS Danny the Champion of the World and Fantastic Mr Fox by Roald Dahl are also wonderful! And the Black Stallion. I absolutely loved the Susan Cooper series, but fyi the Dark is Rising movie was awful (and I thought not appropriate for little kids). My daughter just turned 8 this week and my aunt got her “A Hundred Dresses” by Estes & Slobodkin. Wonderful story with a fantastic message. Also saw on Amazon that there are books on using it as a novel unit. (My mother and I read the book before my daughter, she was less than pleased that we took over her present). Ditto on Mr. Popper’s Penguins. When I taught kindergarten I used to read it out loud. I lost my copy but will have my daughter check it out from the library. Will need to replace that one. Some of the older books are often the best. Thanks for the great suggestions. I always look forward to this post.